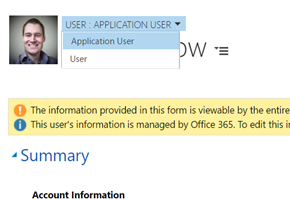 What is great to see with Dynamics 365 is the concept of the Application User. This means that subscribing systems can be connected to external systems using a 'Service Account' style user rather than the previous technique of providing username and passwords. If you try to save the user record on this form you will receive the error 'You must provide a value for Application ID' since this is a mandatory field.